Skills-based volunteering knits together the expertise from the corporate and nonprofit sectors to create sustainable solutions that don’t come undone when partners part ways. There are three key ingredients to the success of The Knitting Factor - Panoramic Perspectives, Skill Sharing and Sticky Relationships. Read case studies, articles and interviews with community leaders on how each of these components come together to create a strong social fabric in our blog post series on The Knitting Factor. Skills for Cities delivered an estimated $80,000 in pro bono serices to the Boston community in just one day of service. Participating nonprofits were selected for their innovative approaches to tackling persistent community challenges that also deliver on the UN Sustainable Development Goals. After the event, an advisory board of Boston’s businesses and social sector players – across industry and size – convened to shape Skills for Cities Boston in 2019 and scale the event to new U.S. cities. Interested in bringing Skills for Cities to your community? Contact info@commonimpact.org to get started. In her day-to-day role, Rachel is responsible for global corporate social responsibility, leading Blackbaud’s 3,300 associates in efforts to serve and give professionally and personally. Tune into this new podcast episode to hear how she is committed to the core philosophy that good is for everyone, championing positive change and inspiring individuals to integrate service into their development. 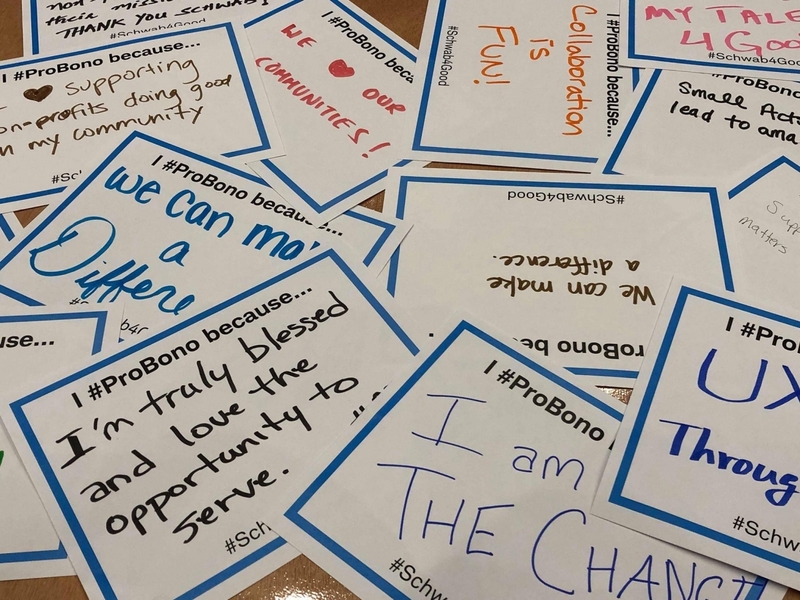 The 2019 Charles Schwab Pro Bono Challenge is Underway! Now in its fifth year, the Pro Bono Challenge engages nearly 400 employee volunteers and 68 nonprofits, and delivers more than $500,000 in value to Schwab communities. This year events are taking place in cities like Austin, Denver, Indianapolis and San Francisco, enabling Schwab employees to make a real impact with the organizations that matter most to them. After the inaugural citywide day of service event, Common Impact convened corporate practitioners to get their perspectives on what worked, what didn't, and how we can make Skills for Cities a successful model for cross-company collaboration moving forward. The measure of community success needs to shift from the investor to the social change being addressed. The systems and success measures we currently use to track impact and community investment still largely center around the investor. In order to be more accurate and meaningful, we need to shift our metrics to center around the social change we seek to make. Achieving equality requires giving up as well as giving back. When powerful and rich institutions and individuals work towards social justice, they must examine not just how they can give back, but also what they can give up in order to make for a more equitable society. Quantitative impact measurement has real limits. Qualitative measures and perception can tell you as much or more about how well an intervention is working as data. There is a need for companies to develop more inclusive practices that meet their employees where they are at. Empathy should be at the center of corporate citizenship practices to allow employees to feel comfortable bringing their whole selves to work. Develop a lifelong learning mindset. Companies need to create space to bring everyone to the same table to learn from one another no matter their background, role, or gender to build connective tissue amongst employees. Be authentic. Be you. Be human. Embrace the shift from corporate social responsibility to human social responsibility. Have a real relationship with your employees, your customers and your community to stand for causes your company cares about.